A playful easy reader in the tradition of Dr. Seuss's Hop on Pop that teaches the basics of word construction. From award-winning humorist Christopher Cerf comes a super-simple, delightfully silly Beginner Book in which the rhymed text and the position of the words on the page teach the basics of word construction. 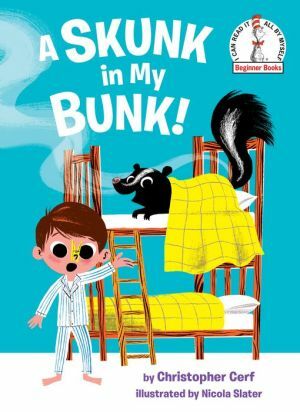 Written in the style of Dr. Seuss's classic Hop on Pop with rhyming words placed directly above each other to show their shared construction, A Skunk in My Bunk! combines phonics and word recognition to make learning to read easy--and fun! With bright, charming illustrations by Nicola Slater, kids will be delighted to read for themselves about a goat in a coat in a boat in a moat, a pig in a wig dancing a jig, a skunk in a bunk, and much, much more! Launched in 1957 with The Cat in the Hat and written specifically for emergent readers, Beginner Books combine an exacting blend of simple words and fun pictures that encourage children to read--all by themselves.